Shropshire Council is proposing a major overhaul of parking arrangements and charges across the county. The consultation creates an opportunity for us to reorganise our car parks and on street parking. This post reviews how we might use our off-street parking most efficiently at the Castle Street and Smithfield car parks. In my view, Castle Street should remain a short-term car park and not become indefinite-stay as Shropshire Council is proposing. One option we might consider is to extend Smithfield to include the Youth Centre car park at weekends. 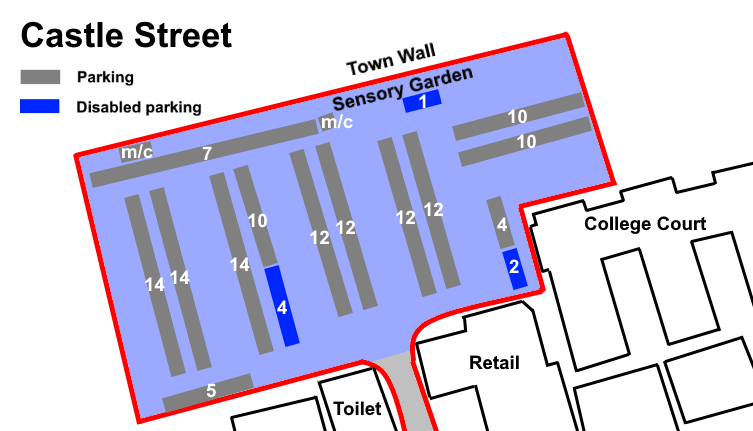 Castle Street has 136 standard spaces and 7 disabled bays. Smithfield is smaller, with 108 standard spaces and one disabled space. The following are the current and the proposed four-hour rates, a typical period that a visitor and many others stay in our town. The current arrangements in the Castle Street car park work well. Shropshire Council, however, wants to remove the four-hour limit on parking. Shoppers, traders and visitors will be able to stay for as long as they wish, providing they can afford £1 an hour. A season ticket allowing 24-hour parking, seven days a week will cost either £116.00 or £133.33 a month (Shropshire Council is consulting on two pricing options). Quarterly and annual season tickets will be available. For the first time, residents will be able to buy season tickets for Castle Street (and other car parks). This will allow them to park without limit for either £640.00 or £800.00 a year. A more restricted ticket for evenings and weekends only, would cost £320.00 or £480.00. Evenings will begin at 4pm. If the prices in the consultation are implemented, it will be possible for residents to leave their car in Castle Street for less than £2.20 a full day. It might be as cheap as £0.88 a day for overnight and evening parking. That will be convenient and affordable for many residents, particularly given the shortage of parking in the town centre. But it could lead to much of the car park being occupied by residents’ vehicles and not by shoppers and visitors. I don’t think we should introduce a system which will reduce short-term parking in the town centre at weekends. The £1.00 an hour charge is too high – a charge of £70p would be more appropriate. I would welcome your views on Shropshire Council’s proposals for Castle Street. Under Shropshire Council’s proposals, Smithfield will remain a long-term car park. This car park is mostly used by visitors and people working in the town. Short-term parking will be cheaper than at present but long-term parking will be more expensive. Currently it costs £2.00 for four hours. The council is suggesting that this is cut to £1.20 – £0.30 an hour. Ten hours will cost £3.00, rather than the £2.00 charged at present. The Youth Centre is adjacent to the car park. This has 23 standard spaces and two disabled bays. The Youth Centre is regrettably little used. During the week, its car park is used by people working at the centre and by parents dropping off and collecting children from St Laurence’s CofE Primary School. The car park is barely, if at all, used at weekends, though many people park there without permission. Could this become a weekend extension to Smithfield car park? If each space is used just twice a day this would provide an extra 50 spaces a day for visitors to Ludlow. Please let me know your views on Shropshire Council’s proposals for Smithfield and the suggestion of using the Youth Centre spaces at weekends. See also proposals for Upper Galdeford car park.
. The council wants to introduce ‘linear pricing’, jargon for car parking being charged at a constant hourly rate. This will replace the current arrangement where the effective hourly rate decreases the longer you stay. Car parks around the county have been divided into seven charging bands, with prices varying from free to £2.50 an hour. Motorists will get what they pay for. If they put £2 into a machine on a car park where the charge is £1.20 an hour, they will get 1 hour 40 minutes.
. Full list of proposed season tickets and residents permit charges. 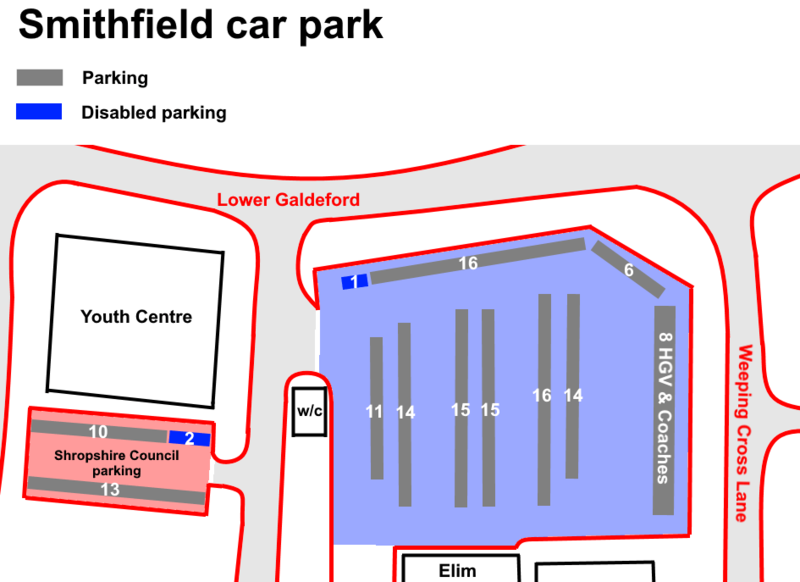 Previous Post Parking consultation – should we rejig Upper Galdeford car park to create more short-term parking? For those living in the centre of Ludlow parking has become more difficult. It would appear a number of users do not live in Ludlow, but come into the town for the day, presumably for employment. The rear Castle Square car park cannot be used by residents, so the only option for them is street parking. As visitors to the town also use street parking, residents find that it is not easy to secure a place. Finding a space in the middle of the day is now almost impossible with most vehicles showing a permit, probably far more vehicles than there is residential accommodation. The system requires “cleaning out” so that permits are only issued to bona fide residents. Currently you are allowed two permits which can be “sold on” to some one out of town. If the permit receiver has to come to Ludlow on a regular basis, this is cheap parking for them. It is therefore proposed that permits be issued only to a registered named person, who must pay Council Tax in the parking area, rather than to a vehicle registration (vehicles are not necessarily registered to an address in town). Hence, if there is a parking infringement, it is the permit holder who is personally liable, rather than the registered vehicle owner. This may deter people giving away their parking “right” by making them personally responsible for any misuse. Failure to pay any imposed fine could affect their Credit Score and hence act as a further deterrent to pass a permit right to someone else. Hence with a parking scheme for regular visitors to park on the rear car park (Why not Issue a new type of ticket only valid on the rear carpark for use by employees etc.?) and permits issued to named resident individuals (in code) for street parking, it may solve the problem of residents being unable to park their car near their home. Also, is there a case for restricting some street parking for residents only e.g. Mill Street? Couldn’t agree more with Alan. If I move my car from Mill St during the weekend I will be lucky to find a spot again until later that evening! My concern is that increases in parking charges will just exacerbate the number of cars parking illegally in Ludlow. I’ve never walked past the chippy on Upper Galdeford without seeing at least two cars parked on the double yellow. That’s despite there being both a customer car-park behind the chippy and free 15-minute parking a few steps away. Cars and delivery vans are constantly parking with wheels up on the pavement. And since the recent resurfacing of Corve street, the lines haven’t been re-painted yet. As a result Corve street is currently a complete free-for-all on parking. There are huge parking concerns that need to be addressed in Ludlow, and making it more expensive to park legally isn’t going to help.